Now that the house is sunnier I've been feeling more motivated to do lots of little decorating projects. My decorating budget is still non-existent, so stay posted for lots of easy changes you can do that cost next to nothing. Most of these involved things I had lying around already, so it helps if you already have things like leftover paint from other projects etc. The first thing I've done is add more shelving in our kitchen. The wall over our table was completely bare. When we moved into our house there was some wood left behind in the garage and I had found three more planks just like the ones I used to make shelves in the studio. All I did was a quick sand before priming and painting. So they are still a little bumpy but I like that look. These were installed with some inexpensive brackets from IKEA. Originally I had planned to just put a bunch of stuff that was cluttering up our countertops on the shelves, but after I'd added a couple of ceramic pieces, I ended up gathering up the ones I had in the studio as well to have my whole collection in one place. 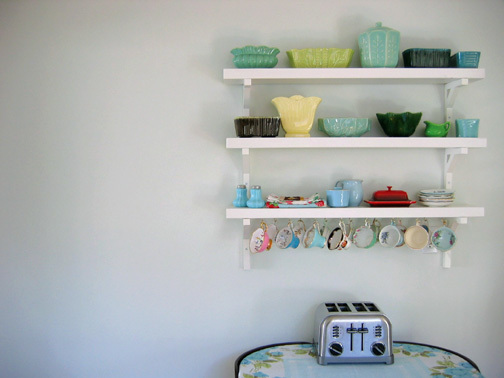 The bottom shelf is the more utilitarian shelf, with the regularly used salt and pepper, butter dish, napkins and coasters. 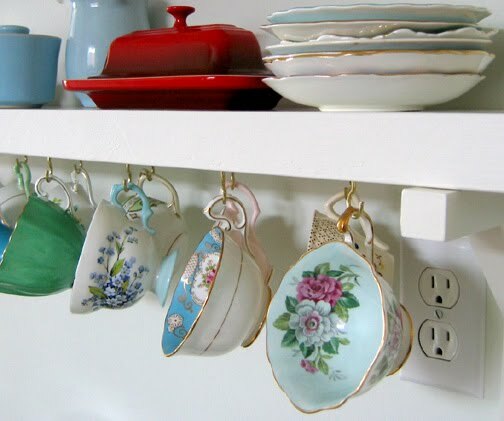 We do use the ceramic planters to store things like garlic cloves but really I just think they look pretty..
Then at the bottom I added hooks for my collection of tea cups. 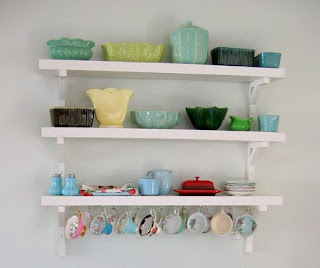 What can I say, I love granny decor whether it's chic or not! It was nice to see this shelf in person today. It looks lovely - especially with your great tea cup collection.